Creativity refers to the ability to produce or create something original, such as a piece of art or music. Considering things from a new perspective is often considered a necessary component of creativity. Thus, creativity and imagination are often closely linked. Novelty: How new are the materials and design processes? Are the concepts unique? Resolution: Does the product work as intended? Is it useful? Elaboration/synthesis: How does the product look? Is it made well? This model looks at creativity as an investment. The value of some ideas or creative works may not be realized right away. They might even be rejected or mocked. The person who developed them “buys low,” attempting to demonstrate the value of their idea or work. Once the creative worth of something has been realized, it becomes more valuable, and the creator can “sell high” before going on to develop other ideas or creative works. Themselves and their preconceived ideas. The collective, often unconscious worldviews of the time in which they live. The creative direction a person’s work takes depends on how they show their defiance. Fluency: Creating many works or ideas over a relatively short period of time. Sensitivity: Being able to recognize problems or a need for change. Flexibility: Producing multiple possible ways to address an issue. Originality: Having new and unique ideas. Elaboration: The ability to take an idea, develop it further, and carry it out. Domain: A particular culture or society’s shared creative knowledge of the visual, performing, or other arts. Person: The individuals who make creative contributions to this domain. Field: The group of people who evaluate, teach, and restore creative works. They control access to the domain. These are only a few of the many ways researchers have looked at creativity. Rather than strictly following one of these models, creativity is more likely explained by a combination of factors. Creativity can manifest in many ways, whether it’s a piece of art, a musical score, a solution to a mathematical problem, or any other kind of work. The act of creating something new not only contributes to a sense of humanity, but also helps make life more meaningful. By developing and using their innate sense of creativity, people can learn to see the world through new perspectives and explore ways to solve any number of challenges. Experts believe creative play in early childhood can help kids develop good emotional health, social skills, and problem-solving abilities. Children who learn these skills in early life may have an easier time sharing and working through difficult feelings. Emotional self-regulation in turn can contribute to adulthood success. If you’re interested in developing your creativity, taking time every day to actively work toward this goal may be the best way to see results.Many employers value creative skills, often categorized with the catch-all “out-of-the-box thinking.” They look for employees with innovative ideas who can suggest and implement processes that serve a rapidly changing market. Skills such as flexibility, productivity, and resilience can help people grow and succeed in the workplace. Practicing specific creative processes, such as art, sewing, music, or dance, can help improve well-being. Art can be a type of therapy. Taking time for creative pursuits can also be a form of self-care. Neuroimaging studies suggest that creativity and intelligence aren’t closely linked in the brain. Tasks involving intelligence prompt a rise in certain neurotransmitters, while creative tasks cause different chemicals to increase. Recent research suggests a person’s creativity may be linked to the level of dopamine in the brain. This link is not fully understood though, so more research is needed to explain how dopamine contributes to creativity. Creativity doesn’t seem to be located in a particular hemisphere of the brain either. Many people have heard the phrases “right-brained” and “left-brained,” with right-brained referring to a stronger aptitude for creative processes. But research has shown brain activity is generally about the same on both the left and right sides of the brain. This doesn’t mean skill sets and aptitudes are the same for everyone. But it suggests a person’s strengths don’t stem from one side of the brain or the other. Creativity may depend on brain processes in other ways. A study from 2018 suggests the brains of more creative people may engage neural circuits that don’t typically work together at the same time. This pattern of brain connectivity may lead to increased creativity. Popular belief often links creativity to mental health concerns, primarily mood issues such as bipolar and depression. Some study results have seemed to support this link. Research from multiple sources suggests mental health concerns and creativity often occur at higher levels in the same families. A small Swedish study from 2010 looked at the brains of people whose divergent thinking test results categorized them as “highly creative.” Though these people had good mental health, they had low levels of dopamine in the thalamus—something previously noted in the brains of people with schizophrenia. A 2015 study found people with certain genetic factors that put them at higher risk for bipolar or schizophrenia also had higher levels of creativity. A 2018 research review also linked schizophrenia symptoms with creativity. This review suggests mild symptoms are linked more strongly to creativity than severe symptoms. Severe symptoms may diminish creativity instead. More research on creativity and mental health is needed to help explain the association. It’s possible some people with mental health concerns turn to creative pursuits as a method of coping with emotional distress. One 2016 study looking at creativity in young adults found those who took time for creative work each day reported more positive affect than those who did not. Some highly creative people with mental health concerns may hesitate to get medication, fearing it might lead to decreased creativity. However, the data on this issue are inconclusive. Most research relies on self-reporting as opposed to measuring creative ability directly. Thus it is hard to tell whether people’s creativity truly changes or whether they simply perceive themselves as more or less creative. Some people do report cognitive and emotional side effects when taking antidepressants or lithium. Others report increased emotionality, clearer thinking, and more creative production as their symptoms reduce. The effects of medication can vary widely depending on symptom severity, the type of drug used, and the individual’s creative process. However, non-drug treatments such as psychotherapy seem to have no negative impact on creativity. It’s important to seek treatment for mental health concerns, especially when they affect daily life. Bipolar, depression, and schizophrenia, the three mental health concerns most often linked to creativity, all increase suicide risk. In most cases, getting professional support increases overall well-being, which is likely to have a positive impact on creativity and productivity over time. 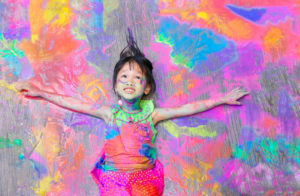 Creativity research suggests developing one’s innate creativity is possible. Some of the following approaches can help boost creative skills. Be curious. Following your interests and learning more about areas you have less experience in can lead to greater inspiration and new ideas. Take a break from your surroundings. Studies suggest moderate background noise, such as the hum of a coffee shop or café, can increase creativity. Taking a walk, daydreaming, and changing the lighting in your workspace can all contribute to increased creativity. Try to solve problems in new ways. Instead of working through a challenge in your usual way, consider a different approach. Experimenting with problem-solving methods that seem unusual or even overly complicated can help you develop creativity by finding unique solutions. Try to think creatively. This might seem simple, but research suggests even attempting to be more creative can lead to increased creativity. This could happen when pathways linked to creativity in the brain become stronger with use. If you’re interested in developing your creativity, taking time every day to actively work toward this goal may be the best way to see results. Higgins, E. T., & Kruglanski, A. W. (Eds.). (2007). Social psychology: Handbook of basic principles (2nd). New York, NY: The Guildford Press.